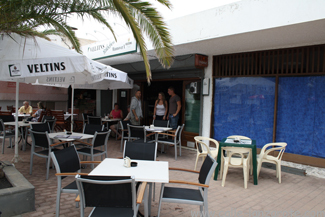 Word about our visit to Lanzarote had spread as we walked passed the Hannover Café near Fariones Hotel (behind Burger King), as we were asked to review them! The café is under new management and is offering a Full English Breakfast for just €3, consisting of bacon, sausage, egg, tomatoes, beans, mushrooms, chips or hash brown, and toast with butter and jam. Unfortunately we had already eaten, otherwise I would have probably been tempted to try it and would have written a full review about it. As it was, we settled for fruit juice and took a closer look at the cocktail menu. For those staying in Fariones the café comes with the advantage of being within reach of the hotel’s WiFi. 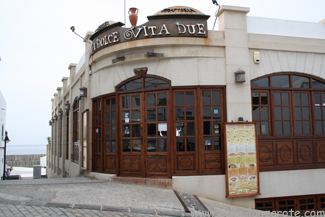 La Dolce Vita is a restaurant overlooking the old harbour in Puerto del Carmen. It is in the same building as Puerto Viejo, but its entrance is on the other side of the building in the Calle de Nuestra Señora del Carmen. Although specialised on Italian food, the restaurant also offers a selection of non-Italian dishes. The children’s menu has a variety of items on it, and the children’s pizza is a particularly good choice as it allows them to choose any pizza of the normal menu and have it in a slightly smaller size for a set price. The food itself was good, and the pizza was even accompanied by a proper pizza cutter! The wine selection was similar to in Puerto Viejo below, but actually slightly cheaper. The house wine, whilst not bad, was from the mainland, although local wines were also available. Instead of ordering a starter, we took the bread rolls and butter which were brought to the table anyway. These turned out to be fresh and warm. The restaurant has friendly staff, although sometimes it did take a moment to attract their attention. As we left there was a whole round of “good byes” to do, including the kitchen staff and the pizza baker! La Dolce Vita is closed on Thursdays. 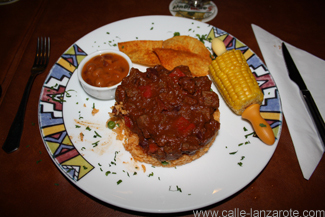 We’ve reviewed Emma’s Cantina Mexicana in Puerto del Carmen before, but having enjoyed the home-made „Chili Rojo“ this year, I felt it deserved a special mention. Unlike the “Chili con Carne” which is made of minced beef, Chili Rojo uses chunks of beef in a sauce with garlic, chili, cumin, red peppers and red wine. It is served on a bed of mexican rice with frijoles (re-fried beans) and corn-on-the-cob. And it was hot. The menu apologises that the dish cannot be made less spicy and I was offered a taster in advance, but there was no need. It was not only very tasty but sufficiently spicy as to put it on a par with Pique a lo Macho in Mainz. I wouldn’t want it any other way! You are currently browsing the archives for the Eating out category.